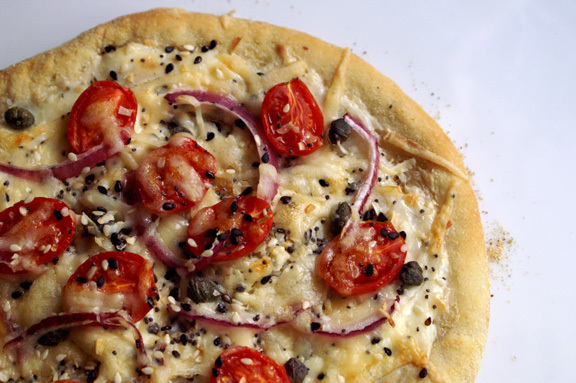 monday bites: everything bagel pizza. I owe you and ice cream sandwich; more specifically, a buttermilk raspberry ice cream sandwich with homemade graham crackers. Problem: it’s a lengthy post, and I’m still working on it. But it’s Monday, which means you deserve a Monday Bites post, and you shall have such a post. Luckily, I had a really stellar baking/cooking weekend, and it produced, among other things, this. It’s easy: I made 4 mini-pizzas out of this, and I think this works well to achieve the “bagel” effect (higher crust-to-insides ratio). If you really wanted to, you could grab some smoked salmon and throw some slices on top after baking. I used a store-bought pizza dough (my choice, but feel free to make your own), the Momofuku everything bagel mix recipe (altered slightly for more garlic, but it’s wonderful as/is), and toppings which echoed what I love on a bagel: tomatoes, red onion, capers, cream cheese, and a little parmesan for bite and texture. I seldom let myself indulge in the real bagel version of this: I typically need a little more protein in the morning to get me going, so it’s an occasional treat on a day where I don’t have much to do. This pizza, however, solves the problem of bread overdose: it the flavor and idea of a classically-topped bagel without the massive carb overload. I think this would be great alongside an equally classic iceberg wedge salad for lunch; it seems as if that would be a nice pairing, and very satisfying. I have lots to get to for you: we really did have an excellent baking weekend around here. First things first, though; you’ll have the ice cream sandwiches this week, in two parts (so it’s not stunningly long, like the apple pie layer cake post.) For now, we pizza. Everything Bagel Seed Mix adapted from the Momofuku Milk Bar Cookbook by Christina Tosi. Which reminds me, I still need to try and make their bagel bombs. I tabled it when my bombs, well…bombed. It wasn’t pretty. Pizza idea inspired by Deb’s recipe in her new Smitten Kitchen Cookbook for New York Breakfast Casserole; at least, I’m pretty sure that ‘s what started this particular ball rolling. When I figured out i wanted to do a pizza version, I made myself not look at the recipe; rather, I just stared longingly at the photo. Now I can finally peek. Note: you can make your everything bagel seed mix a few days ahead of time, if you wish. Just make sure to store it in an airtight container until it’s time to use it. You’ll have some leftovers after you make this, so store properly until you’re ready to use it again. If it sounds like I’m telling you what I do rather than giving you formal instructions, I am indeed doing just that. I know all of you enough to know that some of you make pizzas quite regularly, and probably have your own technique. I respect that, and I’d rather you use your own rhythm here than mine if that’s the case. If you want to try my method or even just pick and choose what you want to do, please feel free. So difficult; toss all ingredients together into a bowl. Stir. Store forever in an airtight container until ready to use. Preheat your oven to 425˚F. Dust a lipless (flat-edged) sheet pan with a little cornmeal, or ready a pizza stone, which I do not possess. Make your dough according to the directions on either your own recipe or the instructions on the store-bought dough package. Mine involves being set out at room temp for about 30 minutes, and then I get to work. I cut my dough into four equal pieces, stretch them to form small pizza rounds, and then place them on your prepared sheet pan. I let mine rest for about 5 minutes, brush with a little olive oil (leaving around a 1/2 inch of the perimeter oil-free) then place in the oven for 3 minutes to begin cooking the crust. Remove from the oven, poke any bubbles with a fork, and proceed with your toppings. You’re making 4 mini-pizzas, so keep that in mind while topping. First, spread your cream cheese using the back of a serving spoon (it’s the easiest way, I’ve found, to spread cream cheese onto a semi-hot crust) evenly, leaving an outer 1/2 inch border. Sprinkle a 1/2 teaspoon of everything bagel seed mix over each pizza, then top with 1/8 cup of parmesan each. Add to each about 12-16 tomato halves, 1/2 teaspoon of capers, and a few slices of onion according to your individual taste. Sprinkle the remaining 1/8 cup each parmesan cheese overtop, and sprinkle each with 1/2 teaspoon of everything bagel seed mix. Place back in your oven and bake for 10-12 minutes. Your pizza edges will be golden brown, your parmesan will be melted, and your cream cheese layer will be lovely and browned in places. So pretty. Remove from the oven and serve immediately. Makes 4 mini-pizzas. If I were serving this for lunch, I’d let it hang out alongside a classic iceberg wedge salad. 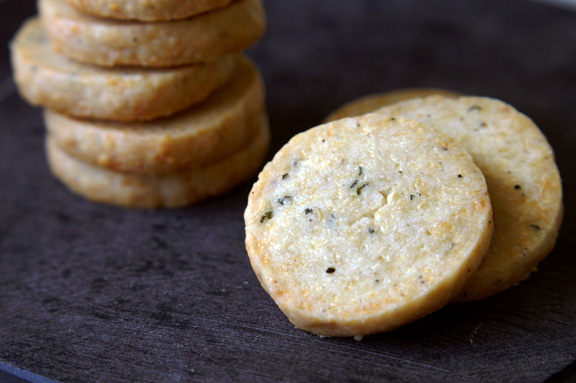 monday bites: parmesan + sage crackers. 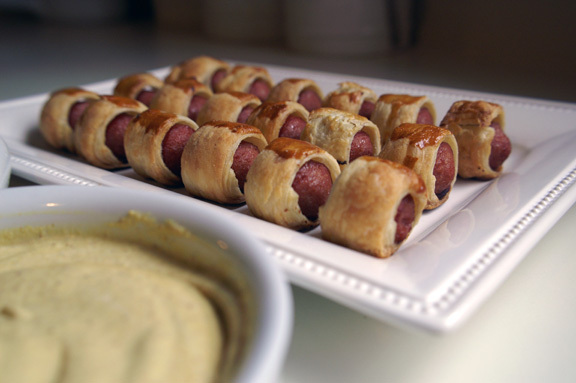 pigs in a blanket + mustard dipping sauce. 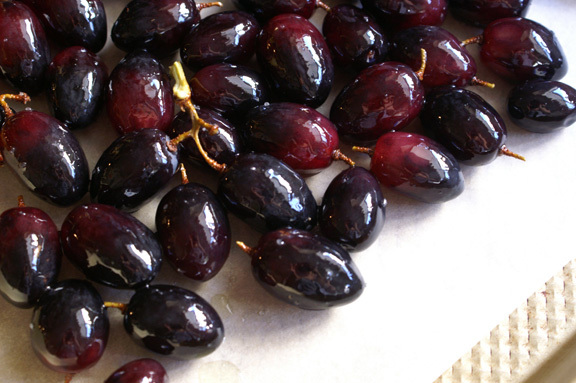 roasted grapes (another cheese plate possibility). thanks, sara! it was really fun to do; i like that anyone could truly customize it according to how much they liked of each ingredient, i.e. i know some people don’t like capers like i do, etc. Even if you sub things in and out, it’ll still be tasty. I’m weeping because I don’t have (what I’m affectionately calling) The Bomb Pizza. Why? WHY so cruel world? These are just…well, they’re the bomb. Gorgeous dahling. you have to try this, Jen. I know you’d love you some everything new york-style bagel. yay! thank you; i was smart and bough a second dough, and *oops* too many toppings, sooooo…it’s raining. pizza night again tonight. I read the title and I was thinking like, bagel bites? and then I was super excited because they are basically Aaron’s favorite thing ever, and then I saw the real recipe, and I was even MORE excited, because I have the same bagel issues as you … how do they cram so many calories and carbs into such a small area anyway? Pure evil, I tell you! And now.. this… and I’ve got a myriad of toppings already in the fridge which is usually my excuse for pizza night anyway sooooo … yup. This is happening. ha! like those little bagel mini pizza things you can buy at the store! What is with bagels anyway: i just really want to be that girl who can eat a bagel every day and not have issues (and indeed i was, about 15 years ago), but i just can’t do it anymore. isn’t like, the equivalent of 6 pieces of bread? yikes. total evil. Also excited to put that everything bagel topping on EVERYTHING! home made pretzels, bagels, and rolls… Omg, I want to put it on everything!!! and now i can’t stop thinking about everything pretzels. That may be super bowl party worthy. adding it to the list. This sounds so good! I love, LOVE bagels, but they’re terrible for breakfast–they never fill me up! Gimme some of that protein. I like the idea of these for lunch, with a wedge salad (!!) to boot. I’m glad your weekend yielded successful baking projects. Mine did too! 🙂 Happy Tuesday, friend! congrats on the baking success this weekend! That’s so encouraging; i know we all have weekends that are like, just a big fat waste of ingredients, so it’s good to hear that you had a good run. happy tuesday back, girl! I love everything bagels…what a great idea! I love that there’s actually cream cheese on the “pizza.” So many different combos you could use here!!! That reminds me that I still need to attempt homemade bagels…. well, you know, a bagel’s not a bagel without cream cheese, as far as i’m concerned, so it had to make it on the pizza. I think the parmesan helps with the cohesion and gives it a more “pizza” bent. I want to try this with smoked salmon, and i think it would be so good with pancetta or ham, too. Mmmm! I’m too tired and drained to articulate much more than “get this in my belly right now, carbs are delicious, everything bagels are my favorite, want want WANT!” So thank you! ha! that’s sort of where this post came from, so that’s a perfectly appropriate comment. I was so happy at how easy this came together (because my brain was struggling with anything more difficult, for sure). you’re so welcome! A) THIS LOOKS SOOO GOOD!! I am totally going to have to make this soon. B) Last month I made a big batch of challah, and, on a whim, I topped half of them with the same everything bagel mix from the Milk Bar cookbook! They were so good like that! I actually still have some in the freezer. C) I REALLY need to give those bagel bombs a try. b) omg challah! i need some tips from you: the SK book has a beautiful challah bread and i really want to attempt it. on the scale of easy to shannon can’t handle it, where does it fall? I’ve never even tried to make a bread like that. And isn’t that bagel mix so good! I’ve tried a few variations on it, and i feel like i love theirs the most. I added extra garlic powder for the pizza (and a little extra kosher salt) but i knew i would have other ingredients to contend with. c) me too: i have a ‘first attempt’ under my belt from a few months ago, but they were…erm….NOT GOOD. but i know it was something i did because they basically just looked deformed and ill-colored, like a bagel with the flu. 🙂 the cream cheese is okay, but it’s very bacon-strong; i’m thinking when i try them i may go for a veggie. but then again, i could have done that wrong too. My SK book finally came on Saturday! I do need to try that challah one day, it looks sooo delicious! The recipe I made is from a kosher cookbook that I have, and it makes a HUGE amount of dough. Seriously. I only make it once or twice a year, because it’s pretty much a full day’s work to make the dough, let it rise, and then shape, re-rise, and bake it all. But it’s a really good recipe, not TOO sweet like some challah I’ve tried, and the dough is a pleasure to work with – not sticky at all. If you want a big project to keep you busy let me know, and I can send the recipe your way! Weird – my team is making bagels AND pizzas this week at school (pretzels & english muffins too). Now I’m thinking I should suggest COMBINING the bagels and pizza. It would make things so much easier. 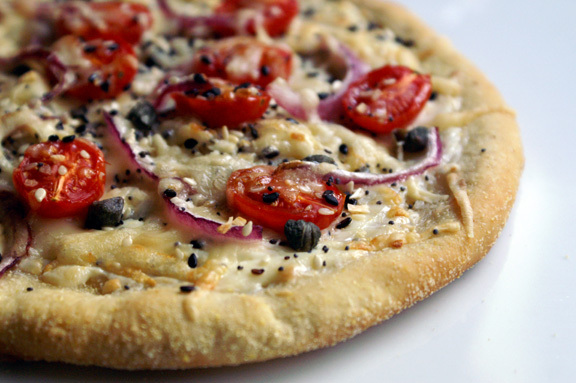 FYI, red onion on pizza makes my heart sing. This is super, super genius.